The business of banking is changing, and it is changing fast! Join industry experts for a webinar to discuss the top 12 business and technology trends that will influence banking and accelerate the change in 2019. Identify your strategic priorities and strengthen your digital transformation strategy. Platforms are revolutionizing traditional business models in every industry and fast becoming a metaphor for outstanding business success. In banking, the platform model will enable institutions to sharpen their ecosystem strategy and build a sustainable revenue source in the times of falling interest incomes. How can banks achieve the explosive success of new age platform businesses like Uber, Alibaba and Amazon? Join this webinar where a panel of global banking leaders will share strategies and case studies of progressive banks, who are making this transition. The already dynamic banking business is set to see more change and disruption in the coming months. Join this webinar to discuss an exclusive report on the top 10 strategic and technology trends that will shape the future of banking in 2018. Register and receive a free copy of the full report after the webinar. 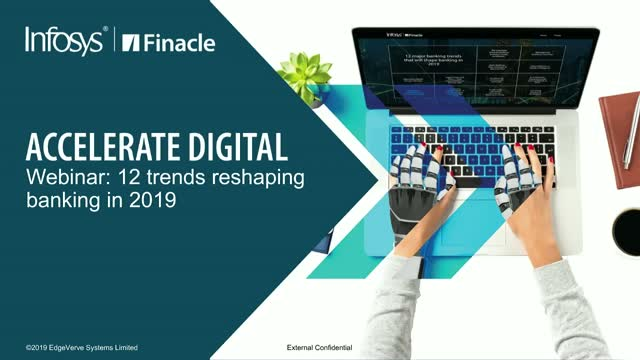 Infosys Finacle presents to you a webinar on what ‘digital banking’ means to the banks, consumers and businesses alike with deep insights and activity mapping. #TrulyDigital banking is not about giving legacy processes a digital facelift. Are you ready to rethink digitization for banks? With our experience of working with financial institutions across 94 countries, we believe, the trulydigital banking paradigm has four stand-out characteristics. Watch this video to learn more..